More than 400,000 time-lapse images were collected of elk and deer within mineral licks. Researchers used GPS, GIS, PDA, and animal-activated camera technologies to analyze data. Results provided a better understanding of mineral lick use and the associated risk for disease transmission. Approximately three million people visit Rocky Mountain National Park (RMNP) in north central Colorado each year, and one of the most popular visitor activities is wildlife watching. Biologist estimates put the RMNP elk population at 3,100 individuals. This abundant elk population, combined with approximately 570 mule deer in the area, makes it easy for tourists visiting the park to see elk or deer during their visit. 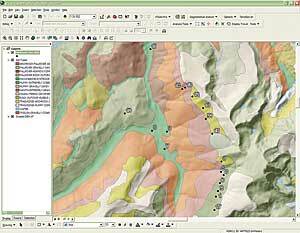 A GIS map reveals mineral lick locations in relation to underlying soil types. Chronic wasting disease (CWD) was first described in captive deer more than 35 years ago near Fort Collins, Colorado. The first documented case of CWD in elk within RMNP was in 1981. Chronic wasting disease infects elk, white-tailed deer, mule deer, and moose, but it is not known to naturally infect other species of wildlife and livestock or humans. Since 1998, CWD has spread to wild and farmed elk and deer populations in several states and provinces. 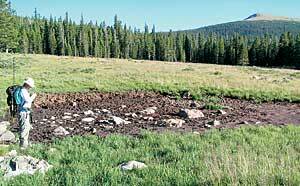 As of September 2006, 63 cases of CWD had been confirmed in RMNP (42 cases in elk and 21 in mule deer). RMNP biologists are evaluating the distribution and spread of CWD within the park and routinely remove infected elk and deer. Part of the National Wildlife Research Center's work includes the Chronic Wasting Disease Project (Fort Collins, Colorado). A goal of this project is to assess means by which CWD is contracted and transmitted in the environment. "Chronic wasting disease in wild and domestic cervids (elk, white-tailed deer, mule deer, etc.) has become a nationwide concern," explains Dr. Kurt C. Vercauteren, project leader. "Realized and perceived threats of CWD have immense implications for federal and state wildlife management agencies, domestic cervid farmers, hunters, businesses, and economies reliant on deer and elk." Chronic wasting disease belongs to the family of diseases known as transmissible spongiform encephalopathies. These diseases cause microscopic holes in brain tissue, giving it a spongelike appearance. The supposed causative infectious agents are modified rogue proteins called prions. There is no treatment for CWD, and it is always fatal. Clinical signs of the disease are not unique and are similar to those for other conditions, such as malnutrition. Infected elk and deer may not show clinical signs of CWD for several years. The mode of transmission of CWD is not well understood. Naso-oral pathways, urine, and feces are considered likely routes for transmission from infected to uninfected animals. Transmission may also occur through environmental contamination. 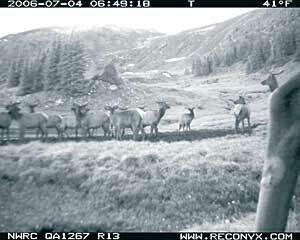 Example image from one of the animal-activated cameras with multiple male elk in a mineral lick. Mineral licks are areas where elk; deer; and, occasionally, moose congregate to obtain minerals through soil consumption. Mineral licks vary in size, are usually void of vegetation, and are often located in damp soil near springs. Licks serve a variety of functions for different species and sexes, one of which is to fulfill nutrient requirements. While visiting mineral licks, animals exhibit behaviors that likely facilitate disease transmission through both deposition (e.g., urination, defecation, salivation) and ingestion (through intentional licking and inadvertently through wallowing followed by grooming), both of which deserve further examination. As detection and decontamination methods are developed, mineral licks would be ideal locations to evaluate and treat as areas where infectious CWD prions have accumulated. CWD researchers evaluated the extent to which elk and deer used mineral licks and examined behaviors at mineral licks that may contribute to CWD transmission. To aid in determining where mineral licks were located on the landscape and exactly how often elk and deer visited mineral licks, the researchers used GPS, GIS, PDA, and animal-activated camera technologies. Potential mineral lick locations were visually identified using ArcInfo and true-color aerial photography. These potential mineral lick locations were then ground truthed with Trimble GPS units and postprocessed with Pathfinder Office software. Ground truthing revealed that the researchers underestimated the number of mineral licks in the study area. The researchers analyzed multiple variables to try to explain why elk and deer use some mineral licks spatially and temporally more than others. On-site mineral lick measurements included soil moisture, mineral lick size (m2), and habitat type. Soil samples were collected from mineral licks and from areas away from mineral licks (control) to determine primary mineral composition differences between the two areas. ArcInfo was used to determine the elevation, slope, aspect, and soil survey type of all licks. CWD researchers collected more than 400,000 time-lapse images of elk and deer within mineral licks. These images often revealed multiple elk and deer within the same lick at the same time. With the images that contained deer or elk, the researchers classified them as depicting animals either consuming soil or simply visiting the mineral lick. In the images, the majority of deer within mineral licks were consuming soil while elk were participating in a variety of activities. Results of soil samples collected from mineral licks that were routinely visited by deer were high in magnesium, sodium, and calcium and averaged approximately 50 percent higher than control samples collected nearby. Trends in mineral content from mineral licks used heavily by elk are less revealing. Mineral lick in Rocky Mountain National Park receiving elk use. The National Wildlife Research Center has been conducting a feasibility analysis to use satellite or hyperspectral imagery to aid in identifying mineral licks using automated imagery classification techniques. To facilitate and standardize data collection regarding each mineral lick, the researchers used PDAs with Visual CE database software and customized data entry forms. They used ArcInfo extensively for all spatial analysis and map creation. They also used animal-activated cameras to monitor the frequency of mineral lick use and behaviors therein. Results of this study will provide a better understanding of elk and deer use of mineral licks and the associated risk for disease transmission. This project shows how GIS technology is being used to build a better understanding of disease dynamics and transmission pathways that may facilitate future disease management actions. Justin W. Fischer is a GIS specialist and his current research and duties involve devising means to reduce chronic wasting disease transmission, tracking and monitoring beaver movements in the southwestern United States and raccoon movements in the eastern United States, spatial analysis, and database design and maintenance. Michael J. Lavelle is a biological technician and his research focuses on interaction of cervids and associated risk of disease transmission. For more information, contact Justin W. Fischer, GIS specialist and wildlife biologist, U.S. Department of Agriculture, Animal and Plant Health Inspection Service (tel. : 970-266-6174, e-mail: justin.w.fischer@aphis.usda.gov).